Want to get married in Melbourne? We take care of the registry so you may have your ceremony in style. Are you planning for a lovely wedding ceremony in a private and stylish setting? You may want to have a large or expensive wedding, but requires a professional wedding style and wedding registry conducted by a Registered professional Civil celebrant in Melbourne. Ro Bailey had previously worked as a relationship counselor and parent educator who provides me with great skill to be used as a celebrant. I enjoy working with people – it gives me pleasure and satisfaction. I especially adore Celebrancy and would consider it an honor and a privilege to be involved in your special day. Ro Bailey specialises with registry style weddings in Melbourne. Some couples ask for ‘quick turn-around’ services. For couples who wish to be married within the legal minimum waiting period of a month, it is possible to book now within a month from the lodgement of the Notice of intended Marriage (Form 13 – regulation 38 – Marriage Act 1961). 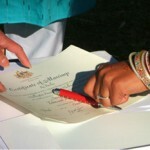 Read more about the Registry style Weddings ceremony planner in Melbourne and the Civil wedding ceremony in Melbourne.